Have you ever heard of Prometheus? According to the Greek mythology, he is the Titan that stole the fire from the gods and gave it to the mortal people. We see a similar idea in the latest LG models. 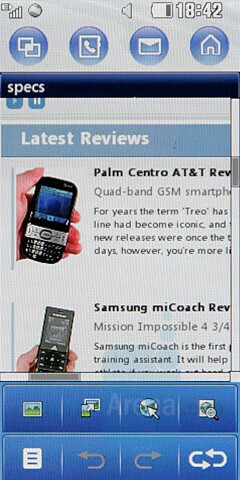 The manufacturer has designed them in a way as if trying to steal away the touch screen technology away from the planet of the PocketPCs and make it accessible for the mass consumer. If we continue the comparison, it should be noted that Prometheus gets a terrible punishment for what he did. LG’s punishment are the complaints of the people, who want a touch display, but are unwilling to say goodbye to the hardware keyboard. To stop the whining, they offer to the marked the hybrid slider KF700, equipped with a 3” touchscreen with hidden regular buttons. You can compare the LG KF700 to many other phones, using PhoneArena's Visual Size Compare tool. 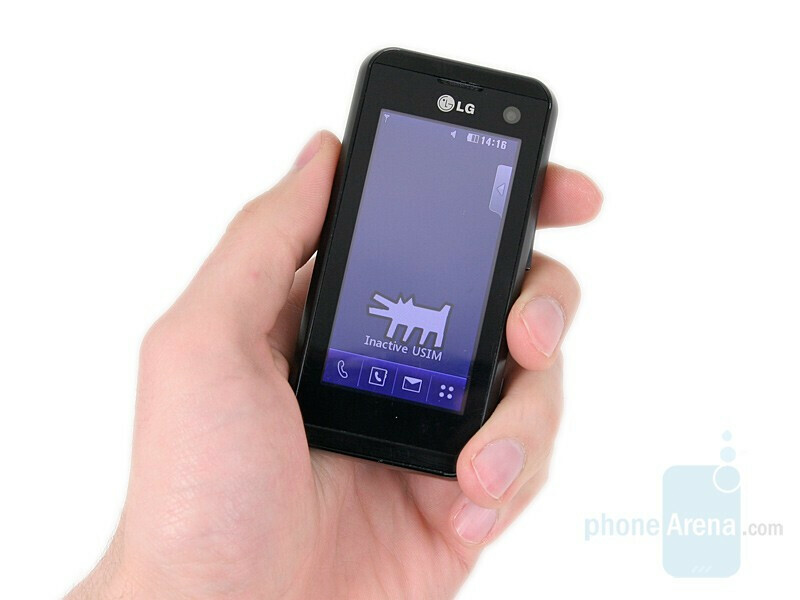 When closed, the phone is very similar to its Samsung rival, the F700. The main difference is that the display is 0.2” smaller and the very device is much more compact, but still, it is far from the modern understanding for a “slim” slider. LG KF700’s resolution is bigger though (240x480 vs. 240x432). Besides, the upper panel is made out of metal and there are no buttons whatsoever present on it. Those are kept for the part that is revealed when opening the slider. 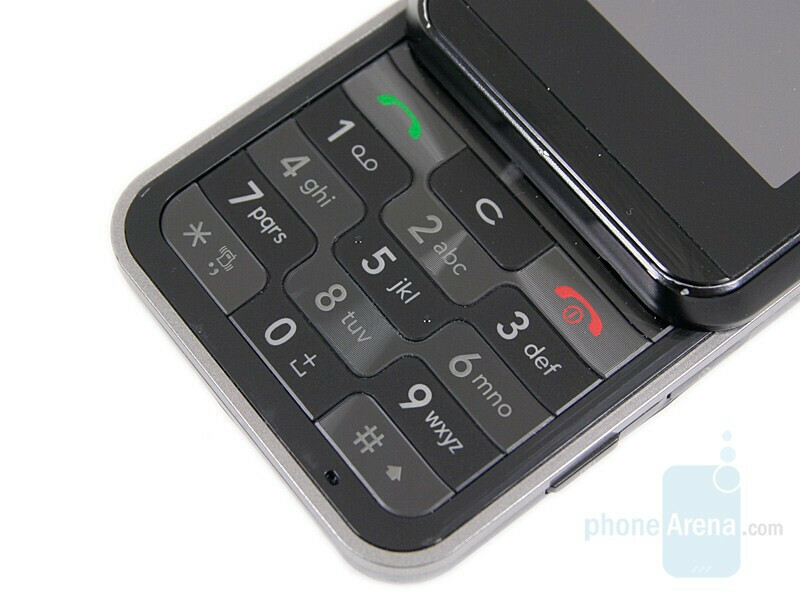 The resemblance with the rival model stops here, since KF700 slides up instead of to the side and it has a regular keyboard instead of a QWERTY. Aside from the standard numerical buttons, there are “call”, “end/power” and a “clear” ones. The functionality buttons have been made unnecessary by the touch screen and such are not present. A navigation wheel has been added on the left side, which is used for scrolling up/down the menus. 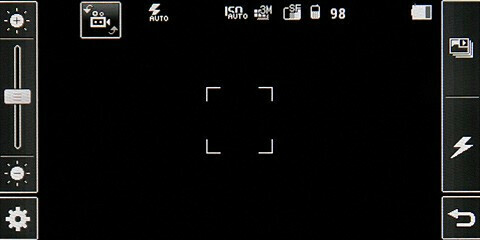 Next to it, is located an OK button for activating the fast access menu and for confirming the options chosen from it. 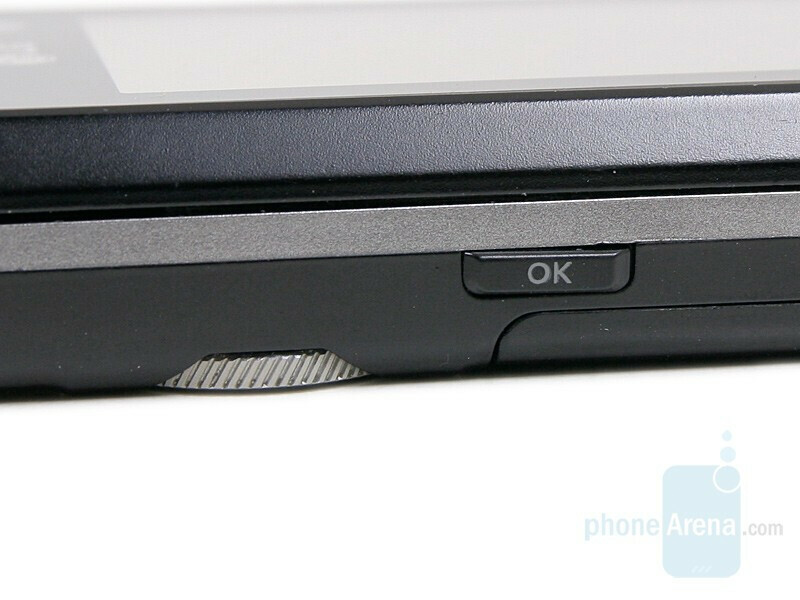 On the right side, are located the camera and locking (simultaneously deactivating the touch screen and the keyboard) buttons, accompanied by the data/charger/handsfree connector. 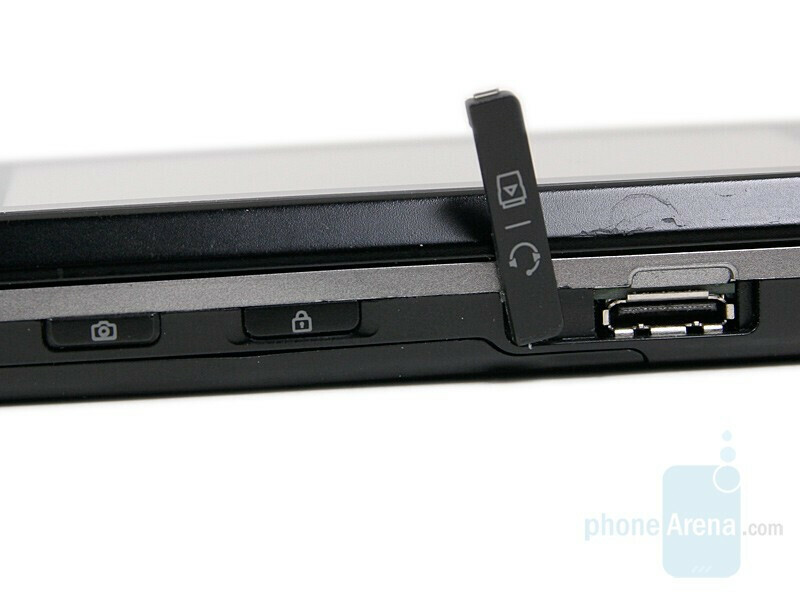 And on the top, is located the microSD slot. 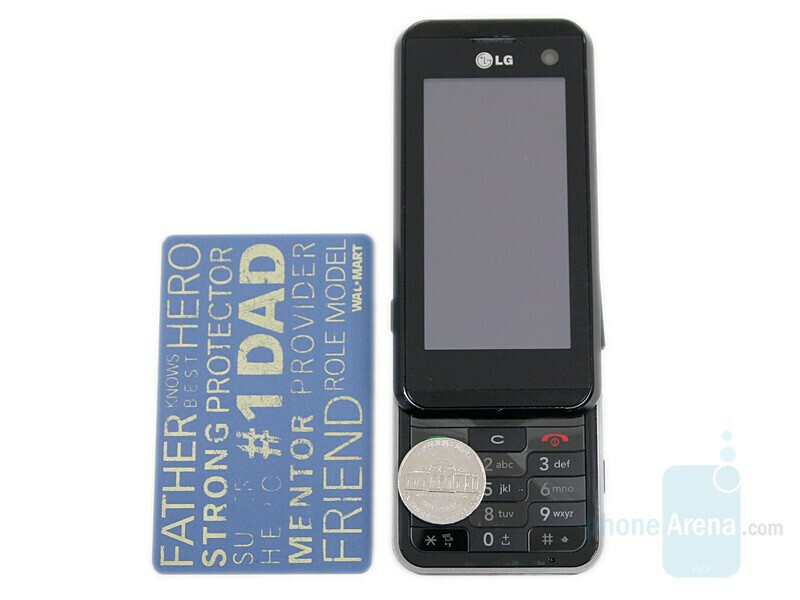 The back of the phone houses a 3-megapixel camera, a small LED flash and the back of the thumb-wheel, which lights up beautifully in blue when in use. Overall, the design of KF700 would hardly attract your attention. 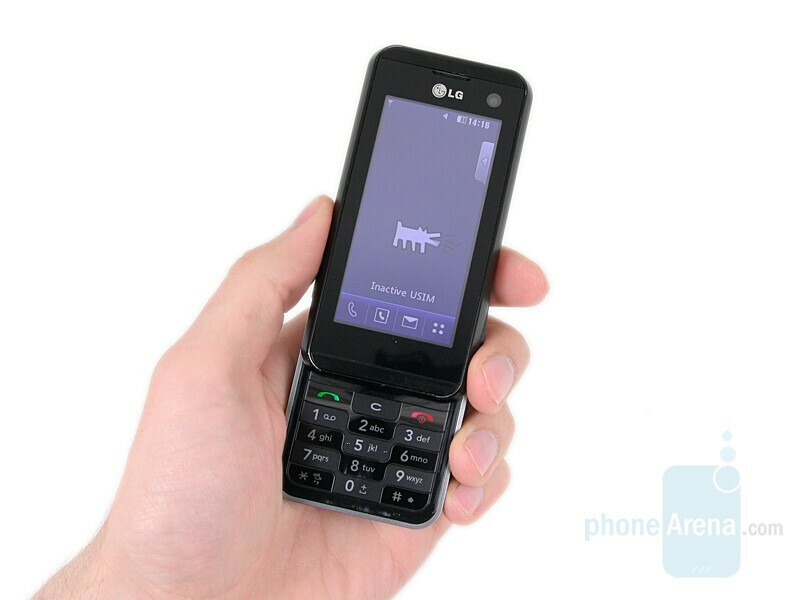 Apparently, for the production of the first hybrid, including a large touch display and a hardware keyboard, LG has had to sacrifice style for the sake of functionality. Don't forget to check our Gallery for a few more images. 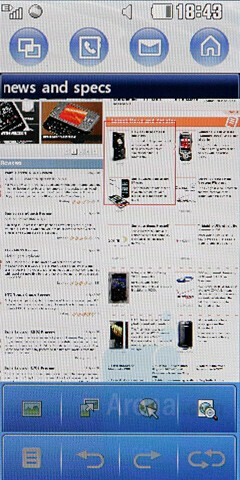 The software used in KF700, is a developed version of the one seen in Viewty and PRADA. 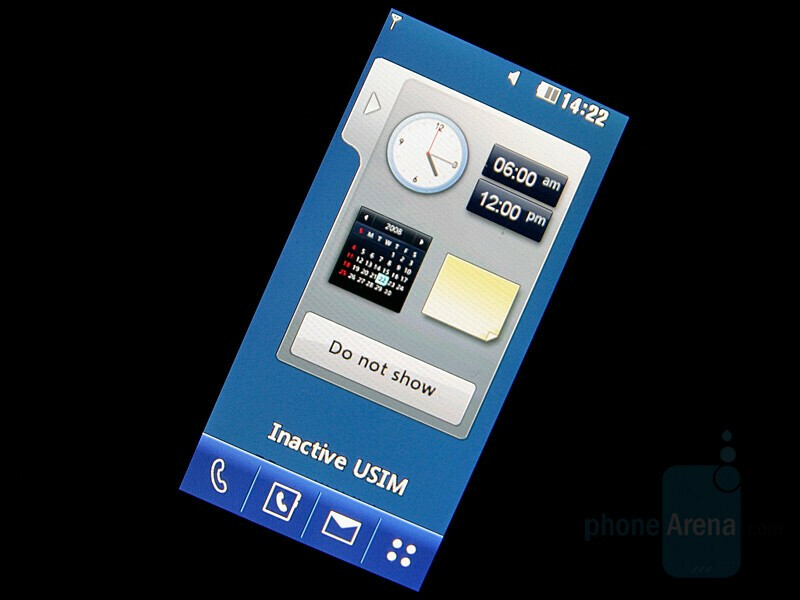 Even though it doesn’t have anything to do with Symbian and Windows Mobile, it offers some solutions typical for them. The home page can be animated (the default pictures are pieces by Keith Haring, as in KF600). In contrast to PRADA and Viewty where the clock was mobile, here, it is static (analog or digital). It can also be replaced by a calendar or a reminder right from here. 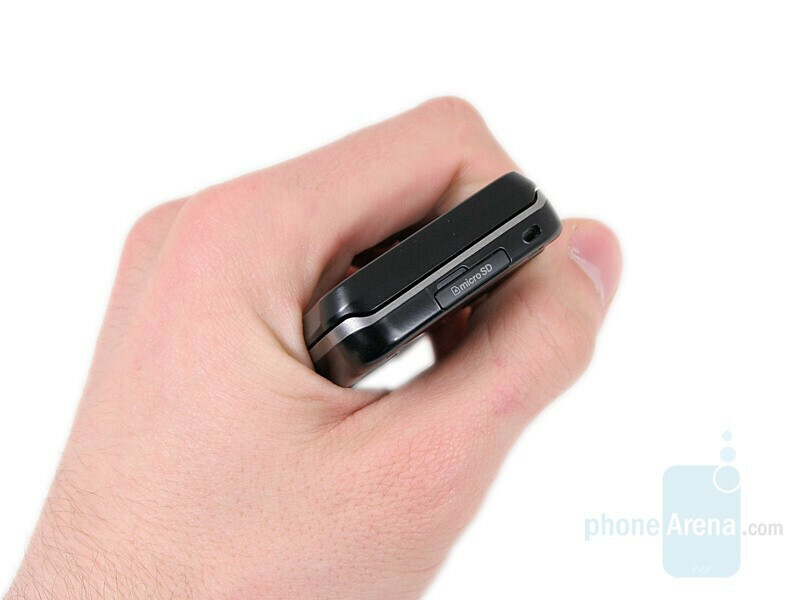 An essential innovation comes in the face of the short phone status, which is visualized on the screen when you press the upper most part of the display. By using it, you will quick find out what time is it, the network mode (3G/GPRS), the battery status and the free memory available. On top of that, you are able to change the ringtone, activate the Bluetooth or switch to plane mode. In the upper part of this and all other menus, except for the main one, there are four shortcuts. The first one is taken from the smartphones and shows the applications, currently active, which you could easily switch to/from. The other two lead to, respectively, (from left to right) to the phone book, messages and the homescreen. As we’ve already mentioned, on the left, is positioned the OK button and by pressing it, a semicircular shortcut visualizes on the screen. 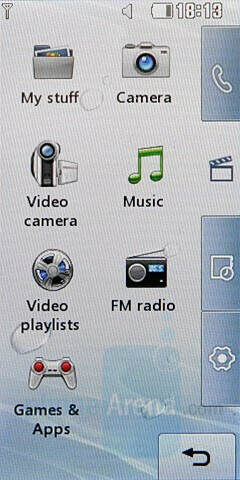 The fast access icons it houses by default are to: YouTube, FM Radio, Video Camera, Inbox, Tasks and E-mail. 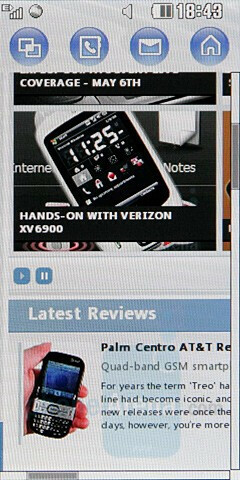 The good news is that it can be customized and navigation is made easy via the thumb-wheel. The rest is almost identical with what we have seen in Viewty. The music and video player, for example, has the same functionality, but its Icons have been slightly changed. 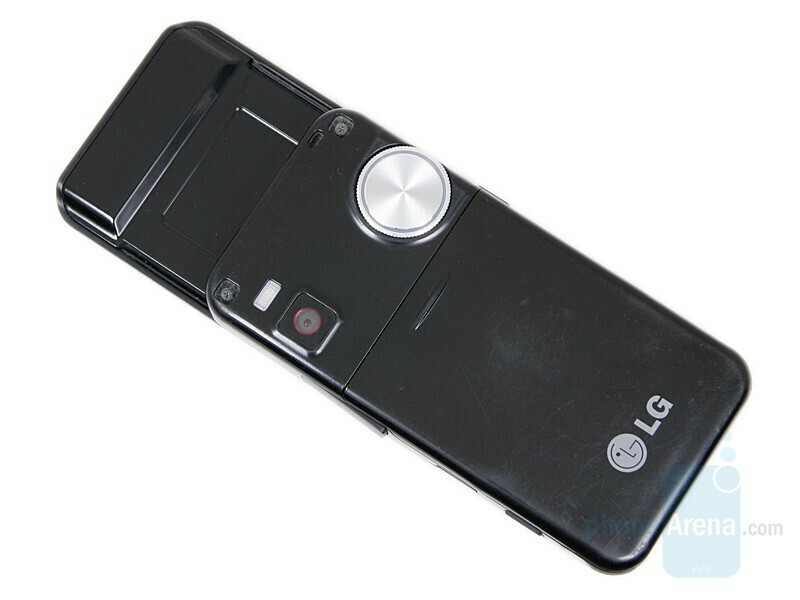 Unfortunately, KF700 doesn’t have DivX support, which was one of the strengths of LG’s top cameraphone. In addition, we would’ve liked to have some soft keys. One of the drawbacks is the lack of any type of on-screen keyboard, so text has to be entered only through the hardware one. Since in this model, the manufacturer has emphasized on the combination of the touch screen and the keyboard, the camera is kind of left behind. 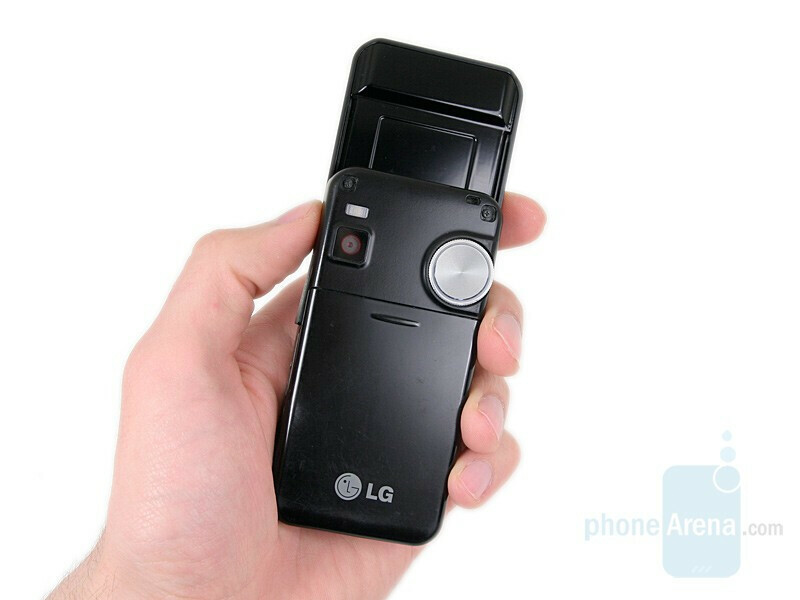 It is 3-megapixel with a LED flash and its interface is similar to the Viewty’s, offering a rich functionality. The difference is in the options available being accessed via small icons in the left part of the screen, and not in the submenus. The camera has limited video recording capabilities - 320x240 pixels and 15 fps. KF700 possesses all the qualities needed to become a great Internet device. 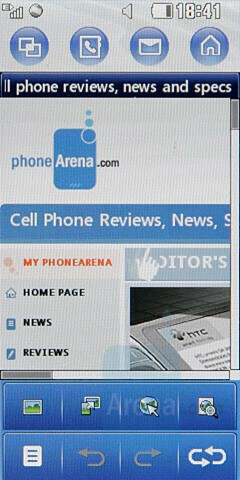 The HSDPA support assures a high-speed connection, and the built-in browser doesn’t have experience troubles loading “heavy” sites. Besides, it is equipped with all modern extras, such as a horizontal pan view for easier navigation and the capability to open various pages in different tabs. Unfortunately, the phone is a tri-band GSM, which limits its use outside of Europe and Asia considerably.